Get the advanced TRU-Infrared cooking system in this Char-Broil. Along with an added side burner, get greater temperature range and control, producing 50 percent juicier results for a delicious cookout spread. proposition 65 reasons:This product contains chemicals, including lead and lead compounds, known to the State of California to cause cancer, birth defects or other reproductive harm. 23.4W x 54.1D x 45.5H in. Good Value and works like a charm. The grill was delivered 2 days before scheduled which was fine with me. I put it together and it worked just like advertised. Cooked our steaks, chops, salmon. to perfection with no flare ups. Very happy with grill. Arrived on time, was well protected in box so no dings/dents. Put together easily. Now to learn "how" to cook on it. Slightly different from other grills we've owned. I will definitely order from hayneedle again. Best Grill I ever had! Cooks the best steaks period! Does the side burner and side tray fold down when not in use? 1. No. The side shelves of this grill are stationary. They do not fold down. Just wondering if you can get the plate that you cook the briqets on for a spare. 1. 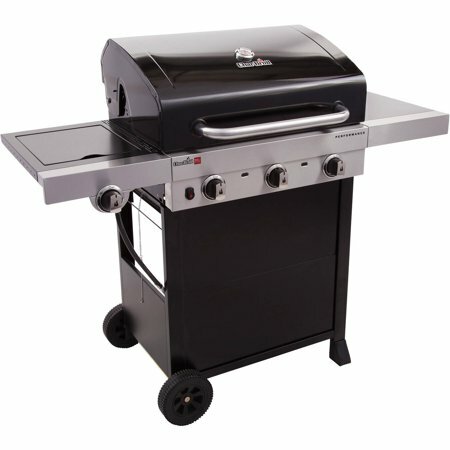 Briquettes should not be used with this Performance TRU-Infrared 3-Burner Grill. To add extra flavor we recommend using wood chips. Wood chips are very easy to use and cleanup. 1. The dimensions of the product are as follows: 23.4 x 54.1 x 45.5 inches.